Garden lovers visiting the north coast of New South Wales should find time to visit the Crystal Castle, a kind of New Age theme park located in the pretty hilly hinterland close to Mullumbimby and Byron Bay. 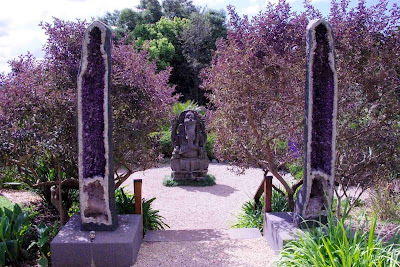 Crystal Castle is no scruffy hippie permaculture garden but a slick money-making business cashing in on the many tourists attracted to the North Coast of New South Wales. The main building at Crystal Castle dates from 1980, but after the original title-holder went broke the property was purchased in the mid-1980s by its current owner, Naren King. King – the self styled ‘Managing Dreamer’ of Crystal Castle - used the property as a base for his crystal importation business, and planted many trees around the once-open grazing land site. The crystal business prospered with the rise of New Age thinking in the 1980s & 90s and the property was soon open to visitors. In 2005 the gardens were extensively landscaped and the grounds now have a lush sub-tropical palette of plants which includes palms, heleconias, bamboo, ornamental gingers and endemic rainforest plants. The dominant focal points of the site are peopled by large recently-constructed statues sourced from various countries in South-East Asia. 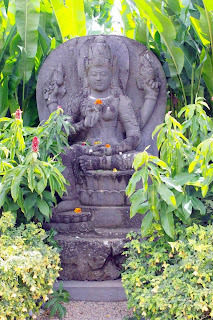 Reflecting the eclectic philosophic traditions of New Age thinking the statues and landscape features come from a diverse range of religions and esoteric traditions, such as Buddhism, Hinduism, Christianity and New Age neo-paganism. 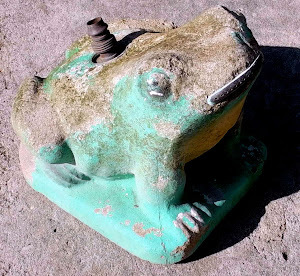 While most of the statues are individually striking, the grounds as a whole lack a sense of unity which, in my opinion, is due to the mix and match use of religious iconography found here. I’m sure that if the designers had concentrated on just one religious tradition – such as Buddhism - the garden would have attained a better sense of harmony than it does now. One hopes the garden will harmonise better when the statues develop a sense of age and the garden plantings mature. A visit to Crystal Castle does not come cheap. At the time of writing an adult entry ticket was $16.90, making a visit here one of the most expensive garden entry fees in Australia. But this is a business, the aim is to make money and visitors are soon relieved of their cash by having their auras photographed, their tarots read and their lives enhanced by buying expensive crystals and New Age decorations from the gift shop. 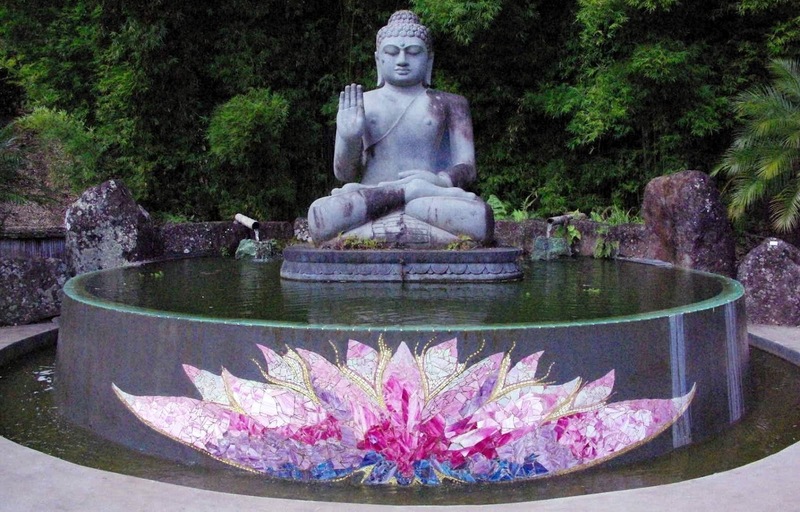 The Lotus Cafe was another example of the entrepreneurial nature of the Crystal Castle business. While nearly all cafes I have visited in ‘alternative’ places around the world have been vegetarian, this one offered instead an odd pan-Asian Mediterranean mish-mash of dishes, much like the grab bag of philosophies offered by the rest of the place. Perhaps a vegetarian menu would have had limited appeal for paying customers so environmental and animal welfare concerns were sacrificed on the altar of this business model. 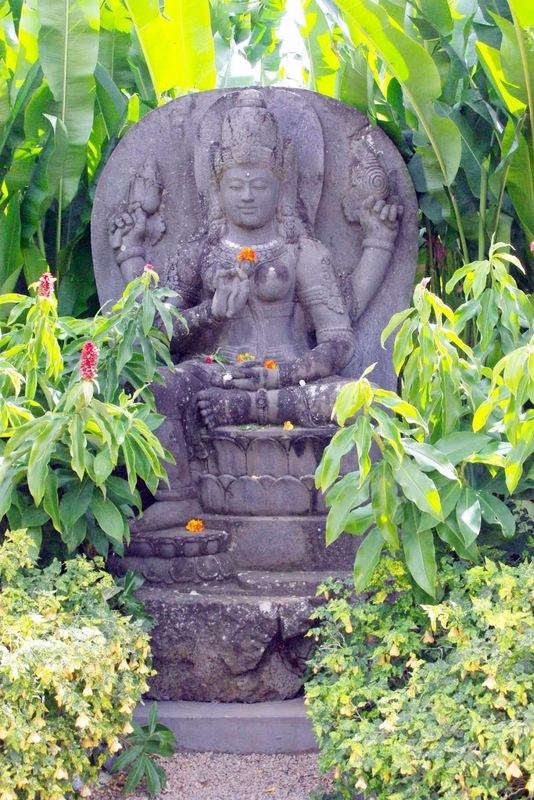 While the crystals, statues and views are the stars of the show, the garden includes many attractive plants. During my visit Eupatorium, Streptosolen and tropical Vireya were flowering their heads off. I also loved the double pink Abutilon, and the purple Vitex planted behind the Amethyst Gateway near the cafe. 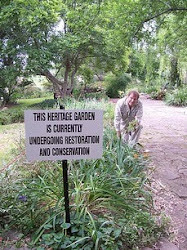 The grounds were certainly well cared for and the gardener in charge seemed to have her heart in the right place. Despite my cynicism of all things New-Age, I must admit that most visitors, including me, enjoyed their visit to the Crystal Gardens. It was a hoot! Very interesting Silas. I was going to say you were being a bit cynical but you admitted as such near the end. 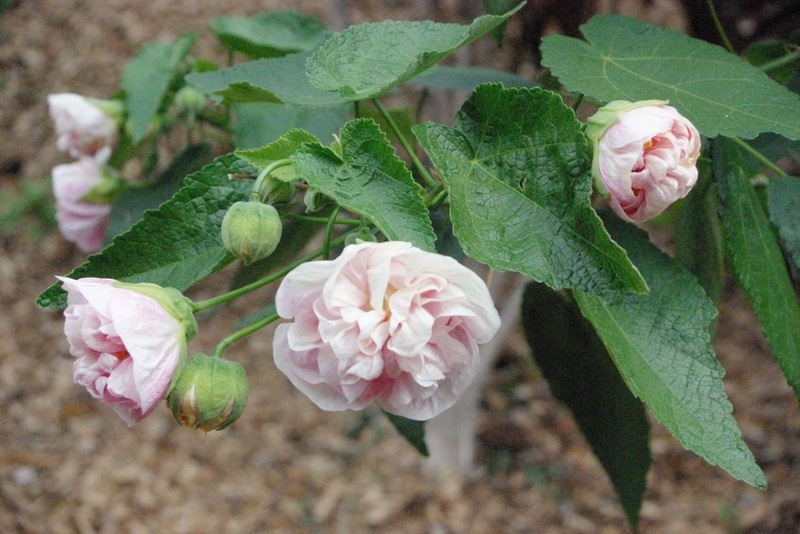 Did a cutting of that double pink Abutilon slip into your pocket?Lovely!